If you happen upon a couple in 1920s garb having a heated discussion about love on a park bench in Central Park, don’t worry, you didn’t fall asleep watching Netflix. If you spot a pastel solar-powered ice cream truck handing out soft-serves that tastes like sunshine, you’re not hallucinating. 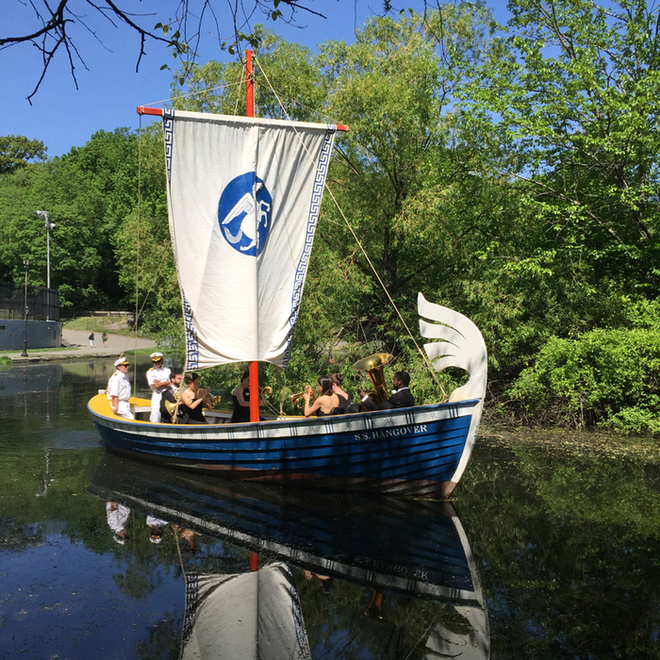 If you happen upon an Icelandic sailboat revolving around an island on the Harlem Meer while a brass band plays a haunting melody, no, you haven’t died and gone to Valhalla. Creative Time, a 40-year-old organization based in New York, has done it once again. Most will remember Kara Walker’s A Subtlety as being the highlight if not must-do photo-op of Frieze Week 2014. This year, the public arts organization has commissioned seven artists to create works that inhabit Central Park North. A somewhat ignored section of the famous green space, the north end has gone through major revitalization in the last 35 years, thanks mostly to the co-sponsoring organization, Central Park Conservancy, which approached Creative Time on the occasion of their 35th anniversary. I spent yesterday morning at Drifting in Daylight, the culmination of Creative Time and Central Park Conservancy's collaboration. Drifting runs Fridays and Saturdays, 12-6pm, May 15–June 20. The daydream began at the Dana Discovery Center in Central Park North and then meandered around the Harlem Meer, a large pond south around The Ravine, through the North Woods, home of the forest nymphs, to the Great Hill. Ragnar Kjartansson's S.S. Hangover, a rehabbed Icelandic fishing boat that some might remember from the Venice Biennale two years ago, sails in a continuous loop around Duck Island. A brass sextet in formal evening wear plays a melancholy but triumphant composition by Sigúr Ros member, Kjartan Sveinsson. In and out of time, the circular motion of the boat, the coda of the song, S.S. Hangover comes around again and again like a weekend hangover. Strolling past the Meer, a lenticular billboard by Karyn Olivier picks up on the theme of history and time with a brilliantly direct intervention. Here and Now/Glacier, Shard, Rock combines three images of Central Park. The first is an image of the scene directly behind the billboard so that from a certain angle, the billboard fades into its surroundings. The second image appears: a shard of pottery with an oriental theme. The shard was found in an excavation of Seneca Village, a community founded by free black people that existed in what is now Central Park between 82nd and 89th. Seneca Village is often held up as a model of a time when the pervasive segregation that defined the 19th and 20th century wasn’t an issue, a time when two ethnic groups, Irish and black, could live side by side. Of course, both Irish and black were marginalized and Seneca Village was destroyed to make way for Central Park. It wasn’t ideal, but the story goes that tap dance came from this early mixing pot. The third image—of a glacier—recalls the Wisconsin glacier that once covered Manhattan, leaving behind the large iconic boulders that erupt from Central Park. Here and Now collapses three points in the history of Central Park into an image that lends perspective to the present and the future of this landmark. Forward. Down the path a gaggle of children have already found Spencer Finch’s Sunset (Central Park), a solar-powered ice cream truck painted in soft pastels and serving an ombre of soft serve to match the colors of the sunset over Central Park. Finch goes to great lengths to quantify colors: he catalogued the colors of the park’s sunsets, doing watercolor studies, then matched the colors of the truck and the ice cream. David Levine’s contribution to Drifting might be the most dreamy of the works. Within a world so embedded in visual culture, where filmed drama is enough to supplement lived experience, the moment you come across one of his eight movie reenactments there is a shift. You question whether what you are seeing is real. You categorize it as theatrical but there is no stage, no 4th wall, and the actors walk off as if you came into just a random couple’s interaction. Bullets Over Broadway (above), The Royal Tenenbaums, and Cruel Intentions are just a few of the iconic movies Levine borrowed from for his piece, Private Moment. The private moment of watching is made a public act. Walking up a hill, a small chrome orb similar to Anish Kapoor’s Cloud Gate in Chicago sits gleaming in the sunshine. Cartas al Cielo by Alicia Framis is a postbox to heaven. Next to the globe is a stand with postcards that viewers are asked to write missives upon and slip into the slot of the orb to send up to the sky. The postcards will become part of the documentation of the work. We then head down a trail into the deep North Woods, along a bubbling stream. Just as you start to get into the hike, dancers in flowing dresses are spotted lingering and laying by a waterfall. Lauri Stallings and her troop, glo, are performing And all directions, i come to you. These forest nymphs recall some of the first photographic hoaxes and within the setting of Central Park, transform and elevate the North Woods into a magical place, somehow more rustic now that one might spot sprites. Along the West Drive that hems the North Woods, pairs of sneakers hang off a lamppost. It appears that the birds have taken to them, adding strings, straw and detritus to transform them into nests. Nina Katchadourian’s The Lamppost Weavers takes objects that might be found in the setting of the park and imagines that these human materials have been repurposed by nature. There are three installations along West Drive, each making use of the natural and human environments, creating a sense of ambiguity between the two. Finally, we climb the Great Hill where a large tent lies flat on the ground, a bullseye of black, green, and red. Around the edge is written Black Joy in multiple languages. Marc Bamuthi Joseph’s Black Joy in the Hour of Chaos is play and performance, somber celebration. Joseph, a community leader, performance artist and musician created this performace that incorporates elements of hip hop, rap, jazz, spoken word, and dance to express the contentious position of being black in America. “Black lives matter when we’re dead.” “It’s mo(u)rning in America.” The lyrics and the performance of Black Joy is so on point it will probably pull some tears from you. The culmination of the performance presents the characters raising the tent, the outer edges propped up with poles. A large center pole is brought under the tent and the center slowly rises as the chant goes on, then *pop*, the pole pierces the center and the tent of Black Joy sinks back down to earth. The choir softly sings, “Ohh black joy…”.